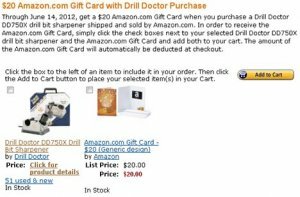 Amazon is running another one of their famous $20 free gift cards deals on tools, and now through June 14th this deal is good on the Drill Doctor DD750X. This model is currently listed on Amazon for 123.99, so the free $20 gift card brings the price down to just under $104. This item also qualifies for Amazons Free Super Saver Shipping. If you have never used a Drill Doctor you have no idea what you are missing out on. You can take most of your twist drill bits and make them good as new at just about a minute each. Model DD750X can sharpen drill bits as small as 3/32-inch up to 3/4-inch and can do a standard drill bit sharpen and it can even create split-points. This would also make a great gift for Dad this Fathers Day.